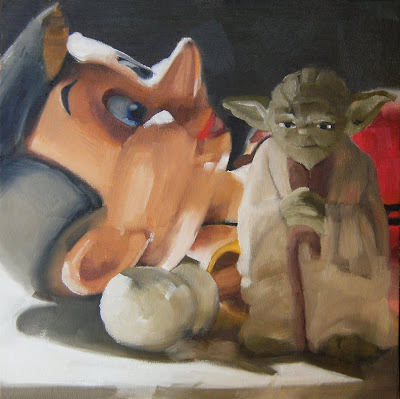 Pinocchio & Yoda II 8" x 8" Oil on Canvas Panel $165. I found your blog on Christopher Greco's blog and I'm so glad I did. I love your paintings, they're colorful and happy and beautifully done. I think you're too hard on yourself, I read many times where you wrote "I need to rework this or that". Sometimes I find if I let a painting sit for a few days, I like it better, I'm no longer focused on that one little thing that I thought wasn't "right". I've added you to my favorites so I can check your blog regularly. Nice Diane! !...there is some "Force" about this painting??? Joan, Thanks so much. I LOVE your landscapes... I'm sure I'm my own worst critic. I'm so used to the careful planning and inch worm pace of color pencils-- The ease of re-working and "painting over" with oils is a WONderful thing. I "get" the notion that a work of art is never done now more than ever. Of course the downside being, nothing ever gets done, haha. Thanks so much for your comments, I'm honored to be in your favorites.